Bears know when to hibernate, fish know when to shed their skin, and cats know when to use the bathroom in your suitcase (well, mine does). Nature has equipped creatures around the world with an internal clock to know when to do IMPORTANT STUFF. I’m no exception. 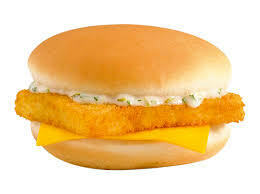 Nature has given me an invaluable gift – the ability to know exactly when I should eat a Filet-O-Fish sandwich. And that time is at exactly three times a year. I can’t exactly explain why. It’s not the only food that I have an internal alarm for. I also have to eat at KFC twice a year. I don’t know when or where, but I know at two points during the year I have to respond to the greasy smooth smell of KFC. But it’s not the same as the craving my body feels for the filet-o-fish. I’m not sure if it’s the naturally-shaped piece of fish or the disturbingly excessive amount of tartar sauce, but there’s something about that sandwich I love. (It should also be noted that I love the word tartar sauce and hearing it always reminds me of this scene from the Simpson’s. But probably one of the biggest reasons I cave to the crave of the filet-o-fish is that each of my kids have been, at one point in time or another, a big fan of McDonald’s. At the present time, my daughter doesn’t even want to drive by the golden arches, much less eat there, but back in the day she loved the nuggets. I’m not sure where I went wrong, but now she only wants to eat healthy food. When she was young, we lived in a town so small, it didn’t even have a McDonald’s. The nearest one was about 10 miles away. And we would often go with a couple who had a daughter same age. What made it even better was that this particular location had a nice playground, and the girls would often approach the event with a level of tepid passion that’s usually reserved for paying taxes. So in an attempt to get our daughters to play, us two dads would often begin playing on the equipment (keep in mind, only because we had to! We certainly didn’t want to. Well, not very much). But instead of excitement, we often received stares that almost bordered on looks of embarrassment. We don’t know these guys, they seemed to be thinking. Come to think of it, that’s pretty much the same look I get from women now. After my daughter outgrew Happy Meals, my son was ready to start chowing down on some tasty mickey d’s food. But his was usually more of a pick-up-at-the-drive-thru kind of meal. And he would only eat nuggets and fries. But it was risky taking him inside. You never knew when he might have a meltdown and start screaming about things he didn’t like in the third person. “Sam can’t LIKE a cheeseburger!” So it was much smarter keeping him locked (ummmmm, make that safe) in the car. The person I was dating at the time suggested that the only way he would start to act better in public was to start unleashing him (ummmm, I mean taking him) out in public more. So that’s what I decided to do – to take him to more public places . . . the minute he turned 21. It turned out I didn’t have to wait quite that long. He began to settle down and I began to take him out more, which wasn’t long after he reached double digits in age. The good news is Sam still enjoys eating at McDonald’s from time. So I can enjoy a Big Mac or a . . . well, you know. Hold on, I think I feel my internal alarm going off now. . . Oh, wait, that was my apple pie alarm. No need to worry – it goes off every day. Haven’t had one of those in probably 10 years, but you made me crave one.